So, this past Monday, August 21, 2017, there was a total solar eclipse across the United States. Like any good photographer, I saw it as an opportunity for photos. 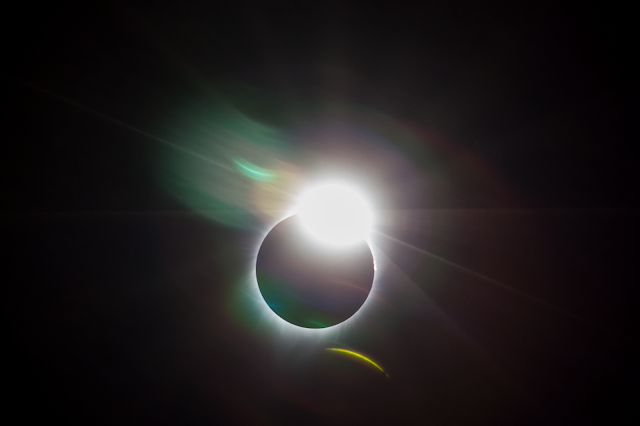 Since Monday, I have seen a lot of amazing images of the eclipse. Sadly, mine really don't measure up fully. Living in the path of totality is great, but despite my initial aspirations of heading somewhere scenic for the event, all the hype surrounding it helped make the decision for me to stay home. 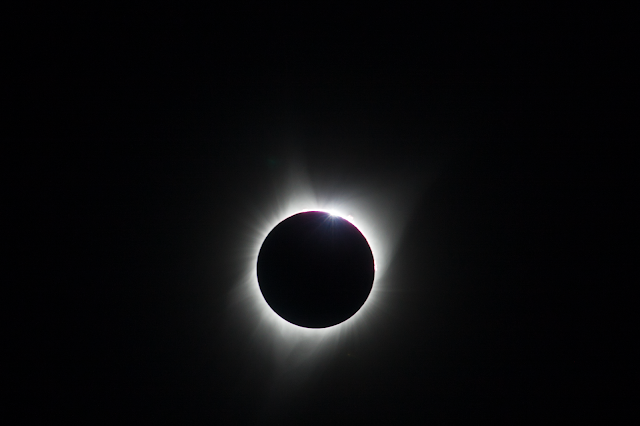 My family and I sat in the backyard and watched the whole thing. I thoroughly enjoyed seeing the moon start to cover the sun, and then to experience the moment that it fully covered the sun. The drop in temperature and light levels as the sun was more and more covered were amazing to witness. My children even went in to get blankets as things started to cool off. I started taking photos from the very beginning, and didn't stop until the sun was completely uncovered once more. I didn't have a set interval for the photos, and manually triggered the camera when I felt I should. I had decided that, as much as I would love to get some amazing photos, that I was going to concentrate more on just experiencing it, while getting some photos along the way. My setup was fairly simple. I don't have equipment to auto track the movement of the sun, although that would have been helpful. I shot with my 70-200mm lens with a Tamron 2x teleconverter, and obviously used a tripod. I had purchased, from Amazon, a small sheet of solar film that I made into a filter for my lens. For triggering purposes, I use an app call DSLRDashboard on my phone. This allowed me to remotely trigger the camera, as well as access a live view image to assist in adjusting the camera as necessary. I used auto exposure bracketing, to help ensure that I would get a good exposure. By setting the 2 second self-timer on the camera, it automatically fired off all 3 exposures each time. The above GIF is the result a quite a bit of work in Lightroom and Photoshop. Much of that work was manually aligning the images since I don't have a tracking device. It's not the spectacular images or videos that you've seen elsewhere, but it is something. The file size is larger than I had expected, so hopefully it loads well for you.